SHARE and Nickelsville have been providing shelter to Seattle's homeless residents for years and were integral parts of the city's push for more tiny-house villages. But now the city appears to be moving away from the organizations' "self-management" model. Over the past three decades, the homeless activist group SHARE/WHEEL evolved from being a grass-roots agitator to one of the largest providers of shelter for homeless people in the region, with a budget of more than $1 million. But now, SHARE, and its sister nonprofit Nickelsville, are facing an uncertain future, as their agreements with and funding from the city of Seattle are unraveling or expiring. 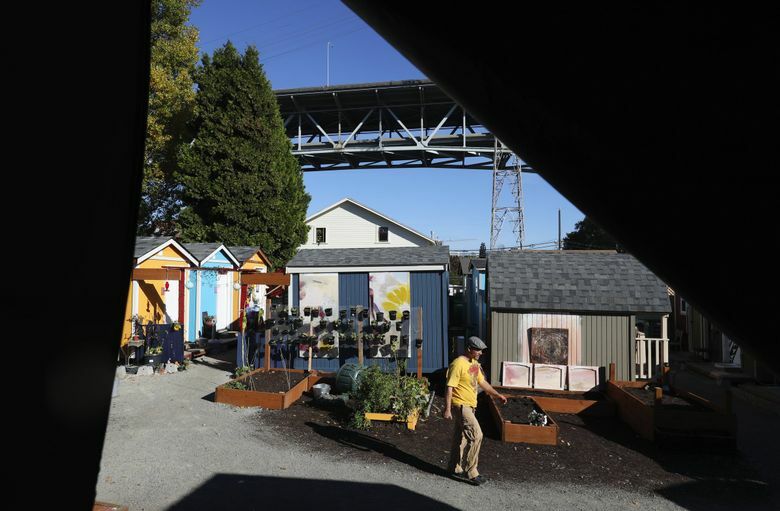 Seattle’s three newest tiny-house villages for homeless people, which have opened or will open this year, do not involve SHARE or Nickelsville, and the city’s preliminary 2019 budget discontinues funding for their 12 shelters. These organizations have been at odds with local governments for years, yet continued to partner with Seattle and King County to provide homeless services. But their confrontational style, along with controversies over how they run their operations, have often rankled local authorities, who in turn have consistently threatened to pull their funding. More recently, Seattle has questioned the effectiveness of SHARE and Nickelsville’s programs, based on new standards that measure how quickly people leave tiny villages for permanent housing. The tensions also extend to SHARE and Nickelsville’s partner on the tiny-house villages, the nonprofit Low Income Housing Institute (LIHI), which provides funding but not day-to-day management. Sharon Lee, LIHI’s executive director, goes so far as to accuse SHARE and Nickelsville of discouraging residents from moving onto housing, a characterization the organizations balk at but with which some villagers agree. “They think that everyone should want to camp for the rest of their freaking lives and have no way out of this,” said one former village resident, who asked not to be named. Seattle has opened eight tiny-house villages for homeless people since 2015 — more than any city in the country, despite some national criticism — on the belief that they are a cost-effective midway point between unsanctioned tent camps and permanent housing. Until now, SHARE and Nickelsville have been integral to the expansion. But recent developments raise new questions about their “self-managed” operating models, intended to give clients the sense of worth and autonomy, at a time when Seattle is shifting to an outcomes-based homeless-response system, which sees more people getting housing faster. Seattle officials are quick to emphasize that the city contracts with LIHI, not SHARE and Nickelsville, for management of the tiny-house villages. But the city is evaluating whether self-managed camps are a good fit with Seattle’s plans to further expand the tiny-house villages. “As our understanding of the villages evolves, we’re certainly looking at whether the self-managed model is the best model for the people living in the villages,” said Meg Olberding, spokeswoman for the city’s Human Services Department. Nickelsville and SHARE leaders complain that their village and shelter operations are consistently underfunded, that the city’s performance goals are unrealistic with the region’s limited affordable housing and that Seattle will not meet to resolve disputes. They firmly believe in their model. SHARE’s origin story traces to protests at the 1990 Goodwill Games, and for the last three decades Morrow and others continued to hector local authorities for more shelter. The group pitched tent-city protests outside the houses of Seattle elected officials, including former Seattle Mayor Greg Nickels, for whom Nickelsville was named in 2008. While separate organizations, SHARE and Nickelsville share a similar DNA and philosophy, started 18 years apart. The groups provide basic, low-cost overnight shelter to hundreds, typically in space donated by churches, and clients must agree to rules, including no drugs or alcohol on-site. The groups have weathered controversies, including allegations in 2013 that SHARE was misusing public funds, and that its leaders were forcing homeless clients to participate in its political activities. The self-managed model “makes it so disenfranchised people can take responsibility for what’s happening in their lives,” said Andrew Constantino, who lives in Nickelsville’s Georgetown tiny-house village. But that strategy appears to be at odds with Seattle’s new approach to fighting homelessness, which emphasizes effectively moving people from the streets, into temporary shelter and to stable housing as quickly as possible. Last year, Seattle announced an ambitious goal for 2018 — to double the number of people who “permanently exit” shelter for housing, to nearly 7,400. SHARE operates about 200 of the 588 emergency and overnight shelter beds, and despite tension, Seattle officials say are still integral to the city’s homelessness crisis. Its shelters show slightly better outcomes than similar emergency-shelter providers’, but Seattle Mayor Jenny Durkan’s preliminary budget commits only enough funding to keep them running through the first half of next year. City Hall officials are tight-lipped about the exact reasons behind the move regarding the shelter funding. But former Seattle city councilman and interim Mayor Tim Burgess said Seattle ending its relationship with SHARE and Nickelsville is overdue. Recent tensions at one of the tiny-house villages — Nickelsville’s Northlake site, on the south edge of Wallingford — highlight the potential for conflict with the current model. Nickelsville leadership, which oversees day-to-day management of the site, voted in September to limit where a city-funded case manager could move within the village, though her job is to help residents get into housing. The next day, two residents yelled at a pair of city Human Services Department employees who dropped by. This, and a series of other incidents — including a Nickelsville staffer and Northlake resident threatening on Facebook to burn down a playground at another LIHI property — prompted Lee to demand two residents be thrown out of the village, or else Nickelsville would risk losing its funding for the site. So far, Nickelsville leadership has refused to remove the pair although Morrow suspended one of them, a Nickelsville staffer, without pay. For their part, SHARE and Nickelsville say LIHI failed to provide competent case managers, and they believe the city and LIHI are looking for an excuse to boot the organization itself from the village. Under the self-managed model, residents elect leaders from among themselves and are expected to work for the camp, as a way to help residents stabilize after years on the streets and to teach residents responsibility, leaders say. But if Nickelsville and SHARE staff aren’t vigilant, people can abuse that power, Lee said. “And then they rule like a tyrant and they intimidate and bully other residents,” Lee said. Despite these disputes, Northlake has proven to be a good neighbor since moving to the area in March, said Mike Dunn, president of Dunn Lumber, who sits on the village’s community advisory board and whose store headquarters sits one block west of the village. “My opinion of the homeless in general has gone from pretty one-dimensional to pretty multidimensional,” Dunn said, his eyes filling with tears. Meanwhile, villages like Northlake continue to accept new residents. Melissa Lee and her four children moved in a month ago, after living in her vehicle. “It helps, the showers, not having to worry about where you lay your kid’s head down,” said Lee, as her youngest son, 19-month-old Johnathan, kicked a soccer ball in the village common area. The future for SHARE and Nickelsville’s roles in the city-funded homelessness response may become clear in the coming weeks, when the Seattle City Council will decide whether to approve Durkan’s proposed cuts to SHARE’s funding. The city must also decide whether to renew permits at the remaining tiny-house villages managed by SHARE and Nickelsville. Constantino, from the Georgetown village, assumes the fight with the city and LIHI has been lost. He’s already anticipating what’s next. “We will just rebuild a new illegal encampment and start exactly where we were 10 years ago,” he said. Vernal Coleman: 206-464-3304 or vcoleman@seattletimes.com; on Twitter: @VernalColeman.